This is the owner’s first house. When he moved there in 2004, the “garden” was primarily lawn—puntuated, in the backyard, by an unruly, unpruned apple tree. He quickly gave up watering the backyard, but even the small front lawn consumed a vast amount of water and time to keep green. 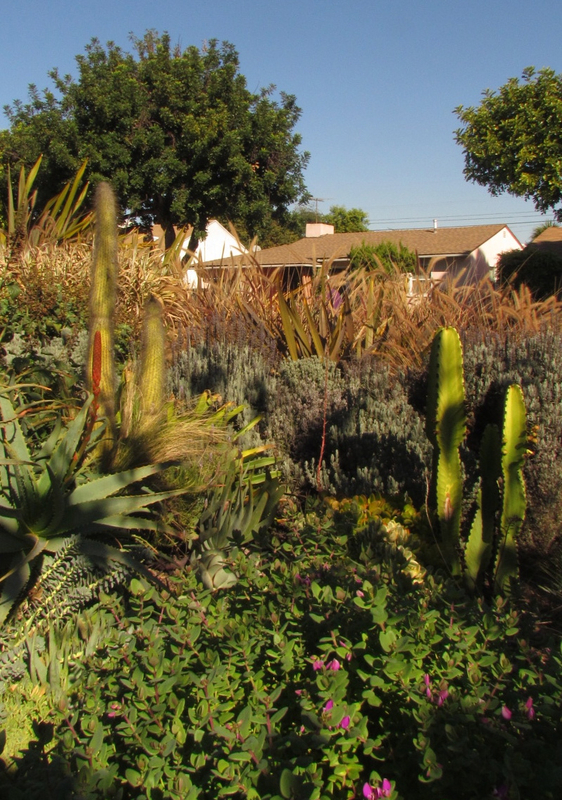 Thanks to the Los Angeles Free Mulch Giveaway program, the owner started getting two truckloads of mulch each year and progressively removed the lawn and amended the rich but hard clay soil we enjoy in Mar Vista. The owner designed the garden—somewhat chaotically, by trial and error. The backyard is the productive side, with dozens of fruit trees that the owner planted over the first few years and annual vegetable crops. The backyard demands more water and maintenance, so the front yard had to be less work. Gradually eliminating the lawn over the first three years, the owner planted Mediterranean: lavenders, bay laurel, grasses, succulents and caccti (mostly in pots because of winter rot problems). The owner couldn't resist adding some fruit trees to the frontyard, planting fig, Moro blood orange, Pakistani mulberry and avocado trees. Eliminating the front lawn decreased water usage by half! The owner hand waters the garden to further check water consumption. Now that the back breaking part is over, he loves reaping the fruit, seeing the seasons change, and observing the wildlife that shares his garden! Stop by and sample a mulberry.